Debt.com » Credit FAQ: Answers to the Internet’s Top Credit Questions » What Will Help My Credit Score the Most? Learn what will win you the biggest credit score gains so you can take the right moves to achieve good credit fast. Whether you’re looking to build your credit score initially or you made some missteps and need to work on rebuilding it, there are some things that will impact your credit score the most. There are different credit scoring models, so there are various factors that come into play. But for the two most used credit scores— FICO® Score and VantageScore – the thing that affects your credit score the most is paying bills on time. If you’re late on paying a bill, that’s the thing most likely to drive your score down quickly. It’s a good idea to make sure you pay off any past due accounts immediately. Take care of anything in collections as soon as possible. Another key influencing factor is how much credit you’re using. Other factors that determine your credit score include how much credit you apply for (inquiries), the mix of credit you have (different types of credit accounts), and the age of your credit accounts. Each of these different versions has specific factors targeted at assessing risks with the type of information related to the specific type of loan or credit you’re applying for – so while the foundation of these credit scores is similar, they fine-tune them to help ensure the lenders get the best information to make informed lending decisions. What has the biggest influence on your credit score? Late payments have the biggest influence on your credit score. This is also sometimes called repayment behavior. It includes looking at whether you’re current on all payments, have any late payments, and have any charge-offs or collections. Some other things that are very influential (though not as much so as paying bills on time) include the amount of credit you’re using (credit utilization). It signals to lenders how responsible you are at managing credit. If you’re maxing out all your cards and have several loans, they may be hesitant to approve you for another line of credit. They may also make you pay a higher interest rate since they see you as a higher risk. Which of these actions would impact your credit score the most? The later you pay a bill, the more it will impact your credit score. While maxing out a card can drive your score down, credit usage (also known as credit utilization) is slightly less influential than paying on time. It can be difficult for even the most organized person to keep up with due dates for various bills. So, it’s a good idea to set up automatic payments or at least add a reminder on your calendar a few days before bills are due. If you’ve already gotten yourself into debt with credit cards, it will help positively influence your credit score to pay those off or at least pay them down a bit since your credit utilization impacts your credit score heavily. Use this calculator to figure out the best ways to pay off your credit card debt. If you are trying to build credit initially and don’t have a credit card, you may want to try getting someone to cosign a credit card for you. This way, you can establish a credit card and begin building up a solid payment history. You can also consider getting a secured credit card, which is usually easier to get approved for because you provide a deposit that acts as your credit limit. When you need to rebuild and improve your credit score, it’s important to know it may just take time. Since late payments or collections can stay on your credit report for up to seven years and impact your credit score for the same amount of time, it may take longer to see an increase in your score than it did for your score to drop. It’s difficult to influence your credit if you don’t know where it stands. Therefore, it’s important to regularly check your credit report. You’re entitled to a free credit report every 12 months from each of the three major credit bureaus – Equifax, Experian, and Transunion – at AnnualCreditReport.com so you can set a reminder every four months to get one at a time. If there’s anything inaccurate or that you don’t recognize, contact the credit bureau where you got the credit report. Then you can make sure you’re not getting points knocked off your credit score for something you didn’t do. Also, accounts or inquiries you don’t recognize may be red flags that you’ve had your identity stolen. You’ll want to get to the bottom of the issue immediately. While different things influence your credit scores, there are a few things that make the biggest difference when trying to improve it. 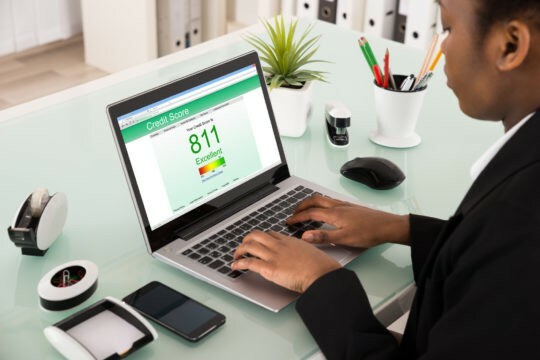 Read more here about credit scores so you can ensure you’re taking the right steps to keep your credit score as high as possible or help raise it. Article last modified on March 25, 2019. Published by Debt.com, LLC .